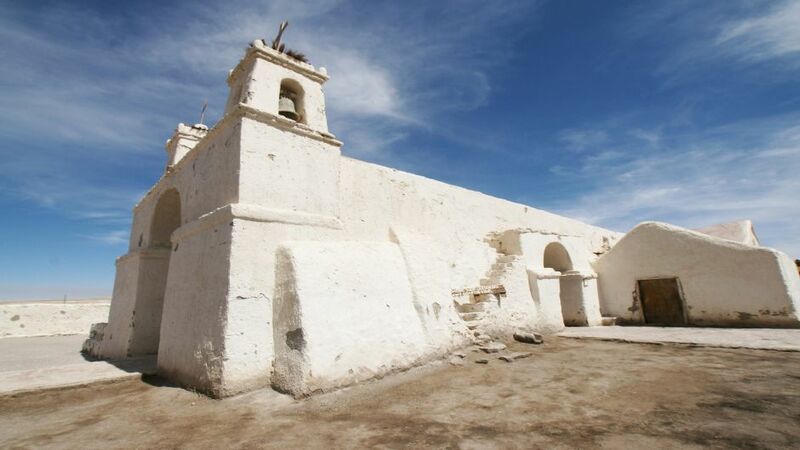 The town of San Francisco de Chiu Chiu, better known only as Chiu Chiu, is a town located 30km away. east of the city of Calama at 2,525 meters above sea level. It is in an oasis that in pre-Hispanic times had a large concentration of Atacameño population and was part of the Inca Trail. It was conquered and evangelized by Spaniards, who founded the current town near where the Indians were, and called it Atacama La Chica. This town houses a National Monument: the Church of San Francisco, the oldest preserved in Chile, built in 1611. Its structure is made of adobe, and the roof is made of cactus wood. Inside this church, several objects stand out, among these are: a picture of the Passion of Christ painted on both sides, and a cross with folding arms to carry it. It has a patronal festival that takes place on October 4 annually. It also highlights its cuisine, based on the products of the area (corn, wheat, Swiss chard, carrots, etc). The typical dishes are the patasca (a stew based on corn, potatoes, vegetables and meat), roasted llama meat and river trout. One of the most typical and authentic places to eat is the restaurant Inka Colla. So far no archaeological sites have been found for the Paleoindian Period in northern Chile, so that the Early Archaic Period is the oldest in the region. The latter period is roughly between 10,000 and 6,000 BC. While in the basin of Chiu-Chiu occupations are not known at this time, some major Period sites have been studied by archaeologists in Sierra de Tuina, southeast of Chiu-Chiu. They found small caves where the first inhabitants of this territory were spending the night, ate their food and made their stone tools. Around the year 6000 B.C. climatic conditions become drier throughout the region and human populations, highly mobile during the previous period, tend to concentrate in sectors with more secure water resources and forage. One of them was the watershed of Chiu Chiu, where sites have been found associated to this new period, known as Middle Archaic (6.000 - 3,500 BC). The main archaeological sites of this period are Isla Grande and Confluence 2, both located near the confluence of the river Loa and Salado are dated around 4,000 BC These camp sites are used only during certain times of the year. During the next period, known as the Late Archaic (3500 to 1000 BC), human groups tend to concentrate their residential camps around the plain of Chiu Chiu, increasing the amount and size of these. Evidence suggests that these populations were in an advanced process of domestication of camelids during this time. Undoubtedly the main archaeological site of the period that also witnessed this, it is known today as Chiu Chiu Cemetery, due to its location near the cemetery of the community today. Dwellings have been found there dated to about 2,000 BC Other camps for this period are Loa West 3 and Concourse 1, also located near the confluence of the Rio Loa in the Salado River. These sites are characterized by small stone tools called microliths, which have also been recognized in many other smaller archaeological sites in the basin of Chiu Chiu. Such is the importance of this basin during the Late Archaic that archaeologists speak Complex Chiu Chiu to refer to groups of hunters of the period and its characteristics lithic technologies. Early Formative Period runs from the year 1000 to 200 BC about. During this period the Chiu Chiu human groups moved their main camp housing north of the present town. 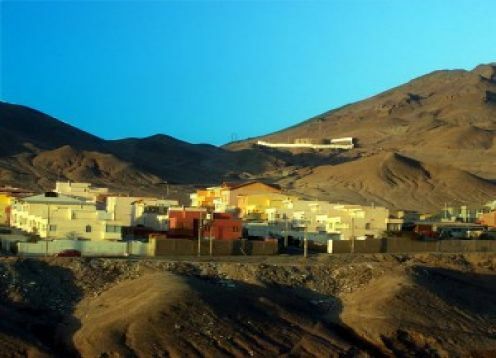 This is the site Chiu Chiu 200, one of the first villages in the region Atacama training. Studies on this site documenting the families of this period had served their domesticated llamas as pack animals for long journeys to the Pacific coast and what is now northwestern Argentina, where they obtained resources to supplement their diet and perform rituals and ceremonies in honor of fertility and the hills. A cemetery is known about this period in the western slope of the Loa River, the site where the dead were probably 200 Chiu Chiu buried. During this era is well documented the use of ceramics, textiles, metallurgy and the earliest cultivated plants, although the camelid hunting and gathering wild plants remained important economic activities. During the Late Intermediate Period (950 - 1450 AD), the region experienced a drought atacameÃÂ±as and families tend to cluster in large villages with water resources. Many of these villages were fortified and known until today as pukaras. The PukarÃÂ¡ Chiu Chiu is an example of this. There he established the local community, dedicated almost exclusively agricultural and pastoral activities, as well as long-distance exchange. The hunting of camelids was already a very high activity. The cemetery known as Gentile, north of pukara, dates from this period. In this village lived the local community when the territory was annexed to atacameÃÂ±o of the Inca empire. This marks the beginning of the Late Period (1450 - 1536 AD). Chiu Chiu passed by a branch of the Inca Trail, connecting the village with the area and the Upper Loa Lasana as well as the villages of Turi, and Caspana Toconce.